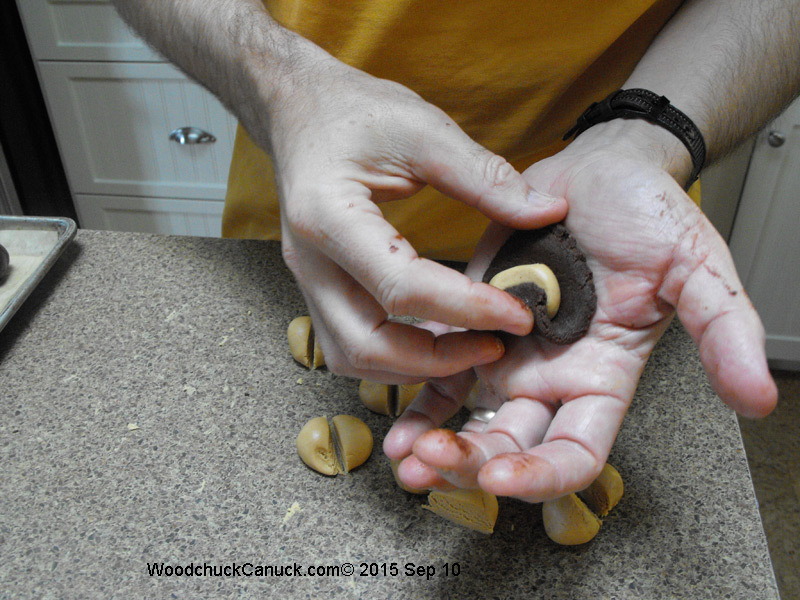 Today we made up a new cookie recipe, we call them Peanut Butter Chocolate Pockets. A well balanced flavour and a stable cookie dough. The little video we made shows the folding technique and end results. Here is the recipe with steps we used. I used a countertop model 5 quart mixer. Continuing creaming for a few minutes. Stop and scrape down once or twice to ensure proper mixing. Now add the dry ingredients to the mixer and slowly combine to prevent a mess 🙂 Mix for 30 sec to fully incorporate the cookie dough. Take that out of the mixer and set aside. Slowly incorporate and you may have to stop and scrape to get what’s stuck to the bowl. Continue mixing until it comes together like a cookie dough. It should have the consistency of putty or play-doh. This step is now complete. Now its time to portion out the chocolate cookie dough. I used a small #24 ice cream scoop and was able to get 36 pieces of dough. Now its time to portion out the filling. I divided the filling into 36 pieces by simply rolling out the filling, cut in half, then divided it up further to get 36 pieces. Portioning out the dough and filling. Now its time to combine the two. Take a piece of chocolate cookie dough and press it fat in the palm of your hand, add the filling and fold it together. 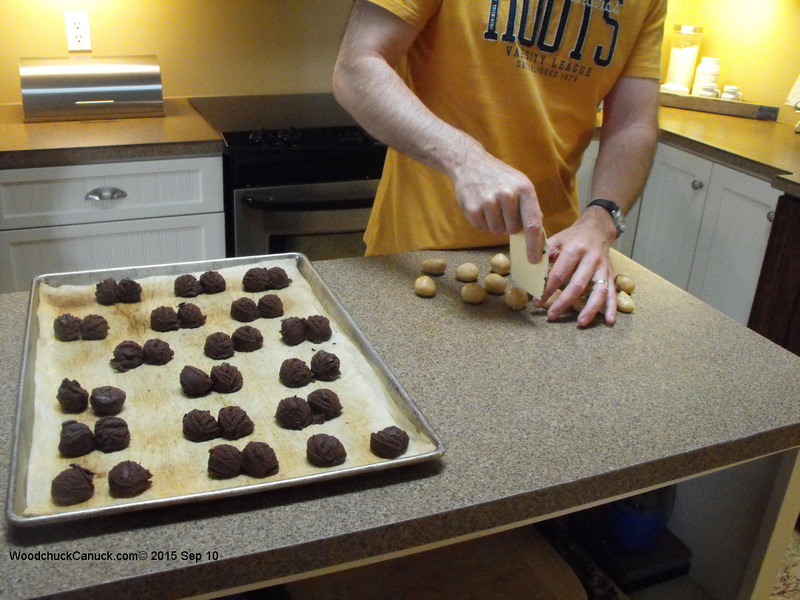 As you can see in the video, the cookies did not spread that much, so you can easily get 35 cookies (5×7) on a 15×21 inch cookie sheet and with enough room to squeeze in #36. The video below (coming soon) shows the resulting cookies and the different techniques we tried to prepare them for baking. Hope you enjoy your cookie time in the kitchen. Please feel free to add your questions or comments at the bottom of this page.